I had a great time at the 2011 Rally of the Tall Pines in Bancroft Ontario Canada this weekend. Great weather and a good result for Crazy Leo. Thanks to all the volunteers and towns people who make the weekend happen. Tall Pines Rally 2011, a set on Flickr. The Southern-Ontario race track Mosport recently transitioned from Don Panoz’s ownership to a new ownership group. They’ve got some great plans for the place and will hopefully be able to give the place the attention it needs and perhaps do some needed updates. One update that I feel is needed is more slow corners to promote passing. The track consist of a lot of long high-speed turns which only really provides for passing with modern high downforce cars like F1 cars and the top classes of ALMS. 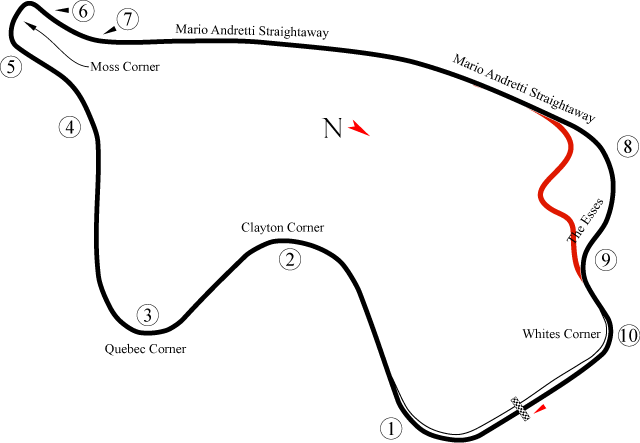 Road cars and other racing series tend to do almost all of their passing in breaking zones or out of slow corners and are forced to follow each-other through most of Mosport’s corners. I propose a chicane or “S” in place of what is now turn 8 and some of 9. Turn 8 is at the end of a long straight and is a sweeper with some banking, it doesn’t slow cars that much of the straight and does not provide for the changes in running speed that promote passing. Further, I’ve seen street cars and lower formula cars have moments overcooking it into that corner — thankfully there’s generous run-off. By adding a chicane or “S” cars will be forced to break down to a slow enough speed to negotiate the turn. The need to get the breaking point right and the opposite direction corner could promote passing through this section and on into the start/finish straight. Further I’d added a “kink” after the new 9 both to respect the current layout of the in-field terrain (as best as I can remember) and keep drivers worrying about their positioning relative to the corner and other drivers. I’ve recent updated the main page of my website. Ever since Facebook first took off I’ve been trying to figure out how to give the various things that dribble out of my mind and are fit (or not) for on-line consumption a proper home. A proper home, might often have been my blog, but more often than not it was easier to post it to Facebook or Twitter — both for the shorter length and the immediacy of the tool. To accommodate this I added my Facebook, and then Twitter status to my web site as the constant “first blog post”. This sort of worked, but still didn’t provide an ideal summary of information. 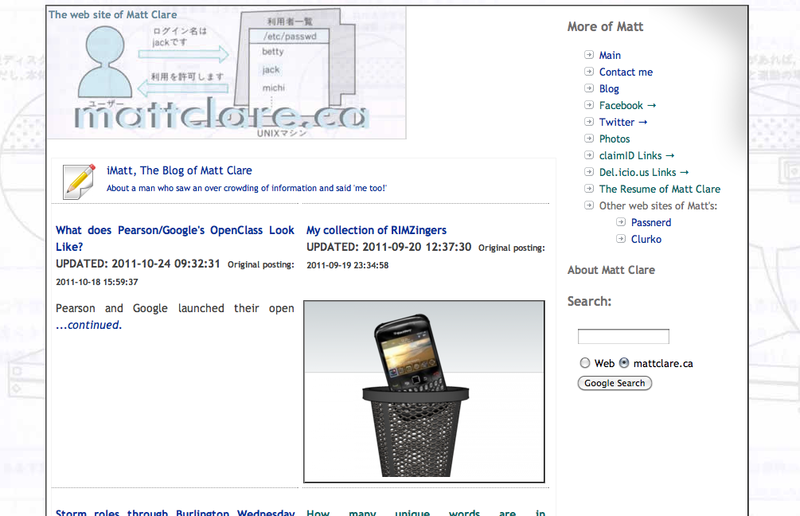 I’ve tried again, this time focusing on mattclare.ca. There’s a little more of a summary of of the blog, focussing in the titles and images, with some teaser text. Further I’m hoping to write more on the blog, and more pictures etc. One thing I still refuse to do is narrow the focus of my posts, that will still range from server admin, to ed. tech. to F1 and fatherhood. You are currently browsing the iMatt :: The Blog of Matt Clare weblog archives for November, 2011 .